राजस्थान सामान्य ज्ञान प्रश्नोत्तरी 211: Rajasthan General Knowledge Sample Question Paper with Collection 10 Question based on RAS PRE 2013 (Re-Exam) for upcoming RAS, Rajasthan Police, REET, SI, Constable, Patwari and other state exams under GK Quiz in Rajasthan GK Sample Papers. You Can Download RAS PRE 2013 (Re-Exam) Paper Full Solved at Rajasthan GK Free Mobile App. 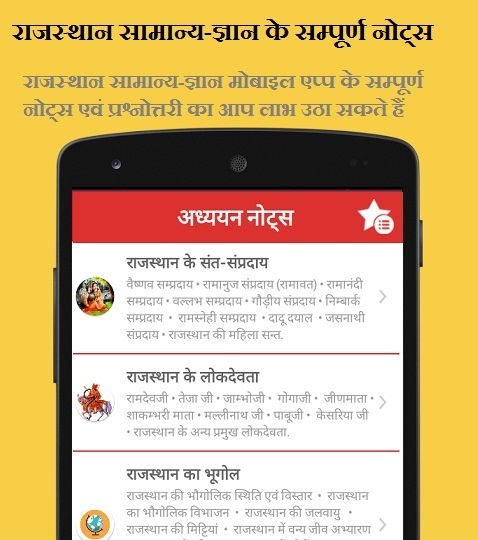 You can also check Rajasthan GK, GK Notes, Objective Quiz at RAJASTHAN GK Mobile App with other General Knowledge (GK) and General Studies (GS) Questions from various examinations of Rajasthan Govt. and central Govt Examinations.